Ionic White is the revolutionary tooth whitening system you have been waiting for!The easiest, fastest way to get your teeth white in just 21 minutes! Whitening your teeth usually is a difficult experiences...you go to a dentist and have to spend a lot of time and money or fumble at home with gels and strips. 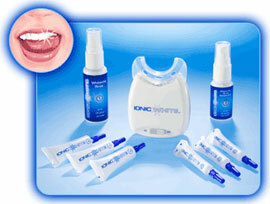 Ionic White gets you the whitening results of a professional, easy enough for anyone!